Can a firebrand opposition leader turn the tide in Turkey? Kemal Kilicdaroglu, the soft-spoken leader of Turkey’s main opposition Republican People’s Party (CHP), often likened to India’s Mahatma Gandhi for his quiet and humble demeanor, is bent on correcting past mistakes. His decision to field a firebrand candidate to challenge President Recep Tayyip Erdogan in June’s presidential election has breathed new life into an opposition that had lost hope for a transition of power after 16 years of Erdogan rule. The CHP has long been considered an ineffective opposition and an unwitting help to Erdogan. After the country’s contentious and tightly contested referendum that approved constitutional changes boosting Erdogan’s powers, the CHP was accused of not doing enough to challenge the outcome, which was tainted by widespread allegations of fraud. The party later supported a government bill to lift the parliamentary immunity that enabled the courts to imprison scores of lawmakers from the pro-Kurdish Peoples’ Democratic Party (HDP), including the former leader of the party and its current presidential candidate, Selahattin Demirtas. 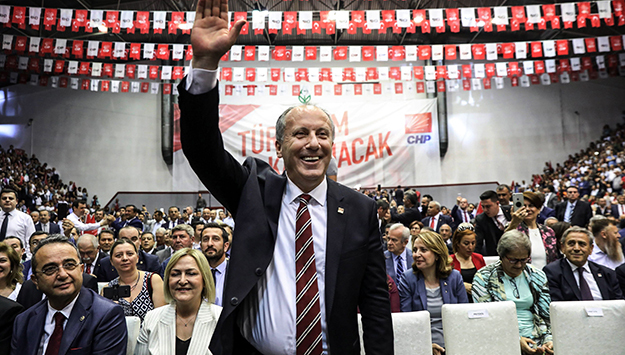 With its presidential candidate, Muharrem Ince, the CHP is hoping to turn the page on past mistakes. Ince is a former teacher and one of the most spirited speakers within the opposition. He has Erdogan’s fiery oratorical skills and street-fighter instincts. Critical of many of his party’s policies, including the decision to lift parliamentary immunities, he ran against Kilicdaroglu for the party leadership in 2014 and 2018. Many think he can appeal beyond his party’s secularist base to Kurds and conservatives. The CHP has long been despised by the Kurds due to the party’s troubled history of denying Kurdish existence and a strong anti-Kurdish streak that still exists within the party. But Ince scored points among the Kurds after he stood up against his party’s decision to lift parliamentary immunities, a decision that mainly targeted pro-Kurdish lawmakers. After his nomination, he paid a visit to the HDP’s jailed presidential candidate and called for his release. If elected, he promised to take “bold and courageous” steps to resolve the Kurdish question. He pledged to return to the rule of law and lift the state of emergency that has been in place since the failed coup in July 2016. Both promises resonate well among the Kurds. Emergency rule conditions hit them particularly hard. The Kurds’ elected representatives have been jailed and removed from office; those who are out are subject to harassment and intimidation. Thousands have faced human rights violations including torture and other ill treatment. Like Erdogan, Ince possesses a common touch. He comes from a humble background. He was born into a pious family. To have a real shot at defeating Erdogan, he has to appeal to the disillusioned, religiously conservative voters that support Erdogan’s Justice and Development Party (AKP). It is a tough task. Despite their frustration with Erdogan’s policies, many fear that without him at the helm, their religious lifestyles might be in danger, including their right to wear headscarves. The issue of the headscarf was one of the most emotionally charged issues in Turkey until the parliament lifted the ban on wearing headscarves on university campuses and in the civil service as part of a reform package by the AKP government. Ince has made overtures to conservative Turks by arguing that his sister and mother wear headscarves and that it is a personal choice that he would not interfere with. Whether that will sway the conservative voters remains to be seen. Regardless, the CHP has come a long way from an ineffective opposition to a proactive party that sets the tone of the debate. When Erdogan called for early elections, partly to prevent a potential challenger, the Iyi Party, from participating in elections, the CHP came to its rescue. Fifteen CHP lawmakers quit their party and joined the Iyi Party, helping it reach the benchmark of 20 lawmakers legally required to take part in the polls. The Islamist Saadet Party, also known as the Felicity Party, fielded its party head as its presidential candidate. The candidate needed 100,000 nominations to run due to rules governing parties outside of parliament, so in a goodwill gesture, Kilicdaroglu asked his members to support the Saadet candidate’s nomination. The CHP also formed an electoral alliance with three other opposition parties in an effort to skirt a regulation that mandates any party must receive 10 percent of the national vote to enter parliament. Through the alliance, the opposition is hoping to deny the AKP the parliamentary majority. All these steps, as well as Ince’s candidacy, have fanned hopes that this time the opposition has a shot at defeating Erdogan. In a country that has been ruled by one man for 16 years, who did everything he could to stay in power—including imprisoning his opponents and passing legislation paving the way to voter fraud—getting the electorate stirred up is no easy task. But bigger challenges are still ahead. An opposition victory might turn into a double-edged sword. The country is in the middle of a currency crisis. The Turkish lira has plunged sharply against the U.S. dollar last week. Inflation was already running high. The drop in the currency is pushing prices even higher. Experts say the country might be on the verge of a financial crisis. Erdogan’s problematic politics are largely to blame for the country’s economic woes, but the opposition will be hard-pressed to fix them if it wins on Jun. 24.